L and I stayed the night at the Martinborough Hotel to celebrate our first wedding anniversary. We didn’t get there until mid-afternoon, but managed to fit in a cheeky 50km ride out towards Lake Ferry and back via Kahutara Rd before dinner at Pinnochio Restaurant just off the main square. Very nice it was as well. They ran out of the dessert that L was keen on, so we shared a dessert and sticky back at the hotel. Refined bouquet. Elegant. Some mealy aromas. Citrus dominant. Not destined to be a favourite, and somewhat fragile, as the flavours did not survive the trip back into town the next day. Wow, this year has gone quickly. 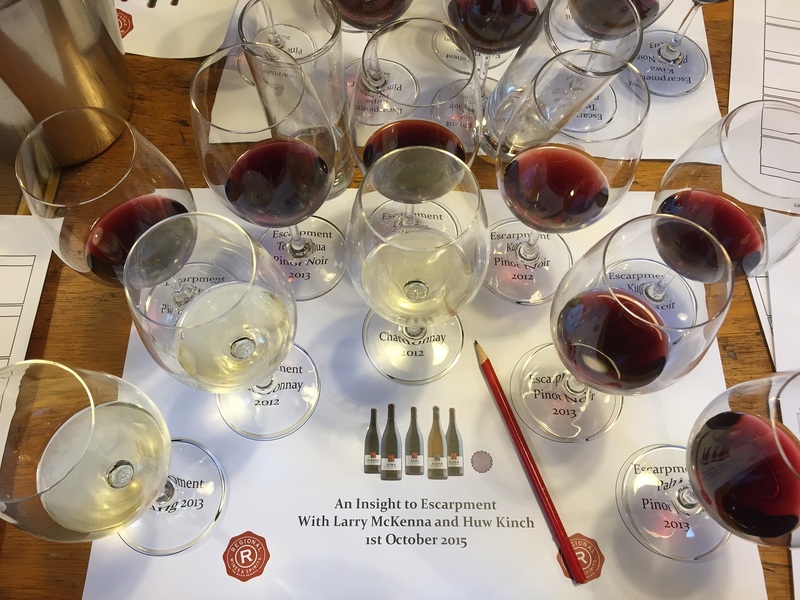 I found myself once again upstairs in the Regional Wines tasting room blind-evaluating current vintage NZ Pinots for their ‘cellarability’ at the annual Pinot Noir Worth Cellaring tasting hosted by Geoff Kelly and Richard Sherriff. There was some talk about Pinots losing some of their appeal, as the previous nights tasting of sub-$37.50 Pinot Noirs had to be cancelled due to extreme lack of interest. I knew I wasn’t keen, and I wasn’t alone. The previous year’s events have been a reliable sell-out, but this tasting showed a few empty chairs. So on to these wines, and to be frank, I thought half were very average. To my palate they lacked enough ripeness, extract and showed too much green stalk. You have to have some leaf to express the floral characters that makes a good Pinot Noir so appealing, but there has to be fruit weight and flavour behind it giving the wine the oomph it needs. For this money they have to taste great. 2014 Greystone Thomas Brothers Pinot Noir Waipara– Deep Pinot ruby, 13.5% alc – Big and fragrant. It seemed attractively raspy and spicy on the nose, with notes of deep pink English roses. Flavoursome red cherries, generous and gorgeous fruit weight. Chewy. 91 points. 2013 Dog Point Pinot Noir Marlborough – Deep Pinot ruby, 14% alc – Perfumed and floral, with slight leaf notes. Delicate, very fine bouquet. Good attack, quite sweet. Gracious, light and somewhat ethereal to taste, darker fruit flavours, balanced, and savoury. Quite long. 91 points. 2014 Escarpment Kiwa Pinot Noir Martinborough – Pinot ruby, 13% – Peppery and elegant nose with dark fruits. There was florality, depth and perfect ripeness. All of the that showed on the palate, with good acid and a fantastically expressive mouthfeel. Intense, long and finishes firm. This needs time. 92 points. I was disappointed with how the Aroha, Peregrine, Maude, Fromm and Mt Difficulty wines looked here. They should have been the rock stars. Maybe I am jaded, but they didn’t look good on the night. Was it the vintage? Hard to say – these wines were from three of NZ’s main growing areas, and I have the Aroha and Maude in my cellar already. Deep blushing pink carmine colour. 13.5% alc. Ripe red berry aromas, tending jammy. Sweet in the mouth, very ripe, not much nuance. Plenty of fruit flavour and intensity – a luscious style of pinot. A bit too simple & direct for my taste. accessible it may be, but not interesting at all. Little tannin on palate, and with new oak apparent, this is not the cool-climate damsel that I prefer… 84 points. 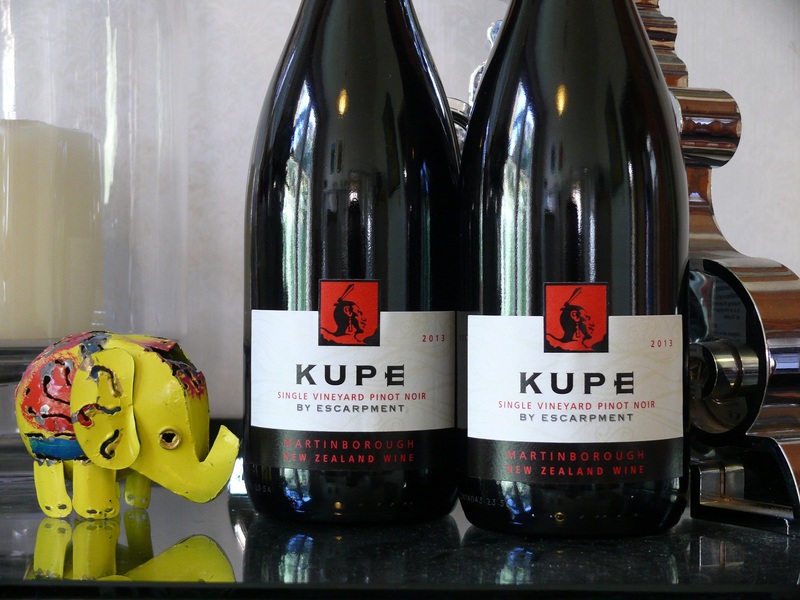 Escarpment Vineyard Kupe Pinot Noir Martinborough 2013 – $$$+ – drink 2015-2023. A superb wine. The highlight of the tasting. Such power and density! Notes from the website: “This is the ninth release from The Escarpment Vineyard’s close planted vineyard on Te Muna Road, Martinborough. The vines which have grown this wine have been our pride and joy since being planted in 1999. The spacing of 1.5m * 1m (6,600 vines/ ha) is approaching the planting densities used in Burgundy from where the inspiration for this wine comes. The season was warm and drier than average for this block. It has created fruit harvested in brilliant condition giving ripe flavours and soft tannins. At the time I said I’d waited 30 years for this vintage! Fermented in wooden French cuvees, hand plunged and aged in 50% new French oak barriques for 18 months. It was bottled without fining or filtration, promoting soft mouth feel and texture. The wine was given every priority during its elevation and now shows all the hallmarks of a grand young wine on release in 2015.